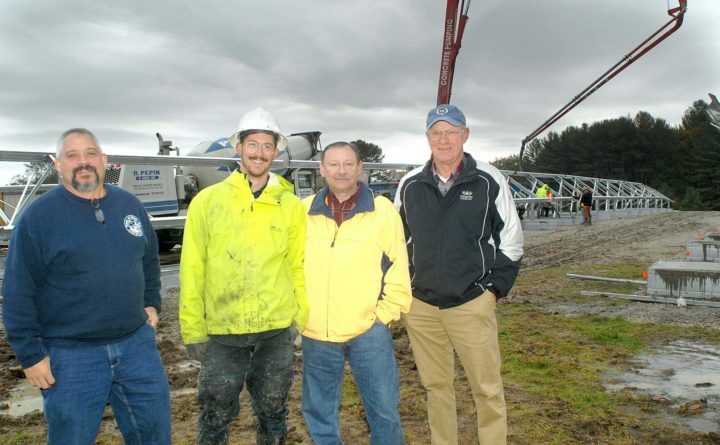 From left, Eliot Public Works Director Joel Moulton, ReVision Energy's Ashton Ireland, Town Manager Dana Lee and local Energy Commission Chairman Ed Henningsen stand at the former landfill site where a 384-panel solar array is under construction. ELIOT, Maine — Dark skies and cold rain Monday morning did not hinder the progress of work on Eliot’s newest solar array. Trucks poured concrete into ballasts that will support 384 345-watt photovoltaic solar panels in three ranks at the town’s former landfill next to the Department of Public Works garage on Route 236. Ed Henningsen, chairman of the town’s Capital Improvement and Energy Commission, Town Manager Dana K. Lee, DPW Director Joel Moulton and Ashton Ireland of ReVision Energy watched as trucks dumped the concrete into a pump truck and it was pumped into the ballasts, aluminum-framed boxes set on the surface. Ireland said the crew will complete the supports and begin installing the panels Thursday. Henningsen said the goal is to have the system ready by year’s end. This is the town’s second solar power array. A system on the DPW garage roof, also built by ReVision Energy, was commissioned in 2013. It has 165 250-watt solar panels and supplies power for the DPW and transfer station. The town will buy the DPW solar array next year for $42,000. Over 25 years, the town will save almost $90,000 over paying for power from Central Maine Power with that array. In 2017, voters approved the installation of the landfill solar array. After negotiations with another vendor fell through, a contract with ReVision Energy was signed, with a 5-year buy-out. The landfill array will supply 95 percent of the town’s electricity needs, and over 25 years save the town $321,000. Both projects are installed under purchase power agreements. According to the Energy Commission, under a PPA an investor owns the solar array and sells electricity to the town at a discounted price over CMP’s rate. The investor, ReVision in this case, takes advantage of a 30 percent Federal Investment Tax Credit and equipment depreciation write-offs. Municipalities are ineligible for these tax benefits because they do not pay taxes. The town benefits because it can purchase the facility in the future at a reduced cost instead of owning it from day one. At the start of year 6 the town can purchase the installation at a fair market value, normally around 60 percent of the original cost. After the purchase, the town owns all the power generated. The solar arrays are grid-connected. Net metering is the key to owning solar power arrays. In Maine, utilities credit small energy generators for the electricity they send into the grid. The credits can be applied to other electric meters. Until this year, 100 percent of power produced by an array was credited. This year, it dropped to 90 percent, according to Henningsen, but it is still beneficial to a municipality. He said Monday the 10 percent paid to CMP is an incentive for CMP to maintain the power lines. Henningsen, a retired building contractor, joined the then Energy Commission before the DPW project. That project, he said, was started by then-commissioners Charles Case and Ben Brickett. A solar power skeptic at first, Henningsen looked at the numbers and became a supporter. Three energy-related bond issues were approved at June Town Meeting: the solar array, a new HVAC system at the Town Office, and the purchase of town street lights from CMP and the conversion to LED lamps. This summer, Henningsen urged the Select Board to give the commission more responsibilities and asked it to be named the Capital Improvement and Energy Commission. Other commission members are Christine Bennett, Erika McCreedy and Pamela Mondschein. There are three vacancies.